Living in Alaska provides plenty of opportunities for new experiences: Hiking through old-growth rainforests; viewing grizzlies in the wild; walking across ancient rivers of glacial ice. 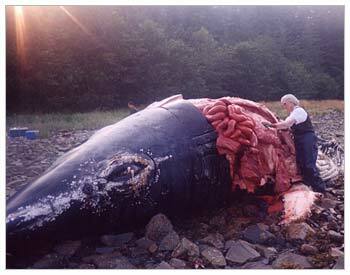 But it is only on rare occasion - even for Alaskans - that one gets the chance to behead a beached whale. When I was invited along on this gruesome expedition it was like winning the wildlife lottery from hell. In August 2004, a 28-ton juvenile humpback was struck by one of the many large barges and cruise ships that travel up Gastineau Channel to Juneau. After the National Marine Fisheries Service completed its necropsy, a friend of mine working for the Alaska Department of Fish and Game got permission to recover the skeleton. He planned to display it at Juneau-Douglas High School, making it the first exhibit of its kind in the capital city. We would start by removing the skull. The plan was to cut through the neck, remove the head and anchor it to the bottom of the channel where fish and crabs would devour the flesh. Only about 10 feet of blubber and guts stood in our way, but we had knives. Mine was a butcher knife brought from home. Riley, my Fish and Game buddy, planned to return the following summer to recover the rest of the bones after nature had taken its course. Ironically, the carcass had washed up near the community of Lucky Me, just south of Juneau on Douglas Island. The sun was out the day we set sail and the wind was blowing hard as our boat pulled up to the rocky beach where the 28-foot-long beast lay on its side. The stench hit me hard, pulling up that morning's breakfast into my esophagus. It was horrific, like nothing I had ever experienced. Riley - a hunter, wildlife enthusiast and true Alaska man - dove right in, shaving chunks of blubber from the rotting mammal while the rest of the members of the five-man crew struggled to keep from puking in our paper facemasks. After taking a moment to steady my stomach, I climbed onto the beast and began hacking away furiously, ripping off putrid flesh and tossing it to the side. A friend and colleague who also chronicled the experience for the local newspaper described me as appearing "angry in [my] knifework." The hide of the whale was tough like a car tire. It had already spent a week or so baking in the sun and oil and puss oozed from its lacerations. Some crewmembers expressed concern that the natural buildup of gas trapped inside the whale could cause it to explode. At the time I wondered if this was an urban myth or if one misplaced jab of the knife would be my undoing. 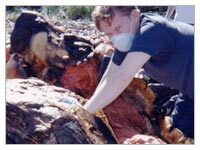 I later discovered that gas buildup caused a 60-ton beached sperm whale to blow up in Taiwan about seven months prior to our expedition. Workers were transporting the 56-foot-long whale to a research facility in Tainin when it erupted, raining blood and guts on bystanders and storefronts. Luckily, our whale remained intact. We spent most of the afternoon coaxing one another to act like men and finish the job, but several of us, myself included, were losing hope that we could complete the task. "How could this be so difficult?" I thought. I had seen video footage of Alaska Natives dismantling whales twice the size of this one with surgical precision in less than a day. But I was no Alaska Native and eventually we realized were in way over our heads. Riley has returned several times over the last year and a half, recovering about 65 percent of the skeleton to date, but the skull, which weighs in at about 300 pounds, will remain on the beach until he can find a vessel large enough to carry it back to the mainland. He said he plans to return this spring to finish the job. In the days following our excursion I realized I would never again see whales simply as beautiful and majestic mammoths of the sea, flapping their flukes and breaching for our amusement. A mural of a humpback outside a bakery in Juneau evoked images of death. The foul odor of decomposing entrails still returns to me in nightmares. And almost two years later, I cannot think of whales without pondering our harrowing experience and being reminded that all life - from the colossal to the microscopic, the majestic to the grotesque - is fragile and finite. Timothy Inklebarger lived in Alaska. He moved to Chicago to write the I Lived In Alaska column.